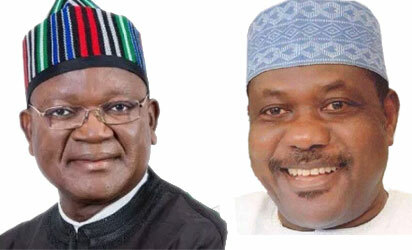 Makurdi- The political battle for the soul of Benue between the Senator George Akume led All Progressives Congress, APC, and Governor Samuel Ortom of Peoples Democratic Party, PDP, has taken a dramatic turn as the kinsmen of the embattled Senator of Jemgbagh extraction comprising Gboko, Buruku and Tarka today pledged their unalloyed support for the Governor ahead of the 2019 elections. Speaking in Makurdi during a courtesy call on the Governor by Jemgagh Elders Forum of the PDP, leader of the delegation, Mr. Sam Tsumba, said the visit was to enable them register their solidarity with the Governor and to welcome him back to his former party. Others who spoke including elders Tarhule Nev, Ikyume Yongu and Mbakorlumun Chia for Buruku, Gboko and Tarka respectively said they were solidly behind the Governor to continue providing purposeful leadership for Benue people. The elders vowed to recall any of their representatives in the State Assembly who was involved in the illegal impeachment move against Governor Ortom. Responding, Governor Ortom expressed appreciation to the people of Jemgbagh for their show of solidarity, pledging that he would continue to work with them to salvage the state. He noted that impunity should not be allowed to continue to rear its ugly head in the country adding that those spreading false stories of embezzlement of public funds in the state would be put to shame.